CAN THE GROUP CRASH AT YOUR HOUSE AFTER THE SHOW? 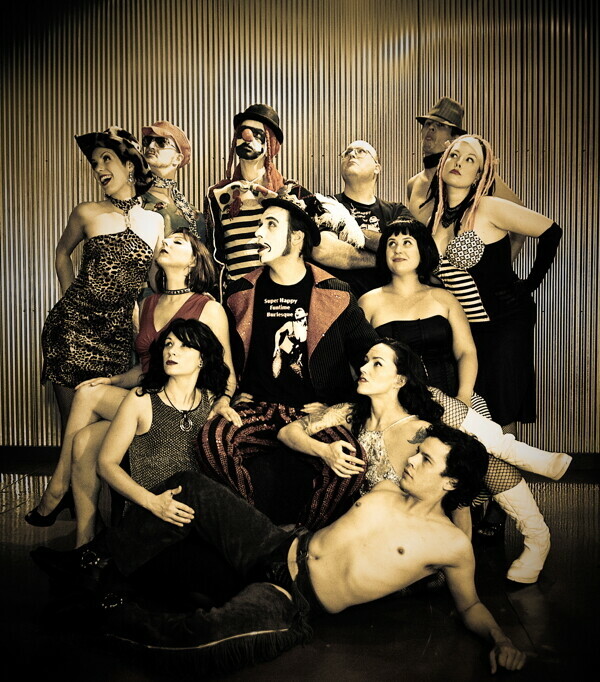 Billed as a “naughty, bawdy musical comedy show,” Super Happy Funtime Burlesque is a Michigan-based theatrical troupe promising a mix of Rocky Horror Picture Show and Saturday Night Live. The word “burlesque” just isn’t used much around these parts. Around here people are much more comfortable talking about polite music in the park, fun fairs, and The Packers. Using the term “burlesque” in polite conversation? Well, that is just going to make your local acolyte blush. That being said, let the blushing begin because The Super Happy Funtime Burlesque show is coming to Eau Claire. This troupe uses music, vignettes, and humor to create a delightful performance which leaves audiences wanting more. The musicians who accompany SHFB make the show feel like musical theater at its best. Think Rocky Horror Picture Show, but just for a second, because you really can’t build parameters around what these guys do. The costuming and acting can’t be ignored. From the narrator of the show with his standard white face and delightful velvet red hat to a rather large man in several states of undress to, of course, stripteases – the show is so vibrant and alive you can’t look away for fear of missing something you will HAVE to talk with your friends about later.